The big screen adaptation of the cheesy, fun but forgettable, 1980s television series, The A-Team, is a lot of big, dumb, fun and entertainment executed relatively well with polish and style. Director Joe Carnahan (Narc, Smokin' Aces) takes the relatively basic premise of a bunch of wrongfully convicted Army Rangers on the run, trying to prove their innocence, and has fun with it. His artistic flourishes bring style and character to what would otherwise be a straightforward, B-level action movie. Carnahan amps up the action and violence and mostly jettisons the cheese factor in favour of serious action while keeping some of the broad humour of the show. Liam Neeson is clearly enjoying himself on screen as Hannibal the leader, chewing up the scenery with his cigar smoking attitude. Bradley Cooper (The Hangover) as Peck and UFC fighter turned actor Quintin "Rampage" Jackson, taking over for the fool pitying Mr. T, as B.A. Baracus are fun and likeable. However, Sharlto Copley (District 9) really hams it up as the wild and crazy pilot, Murdock. Jessica Biel is easily the sexiest military Captain ever put to screen, but to her credit, she plays it straight with a restrained, serious performance and approach. Patrick Wilson (Watchmen) does some very fine work and is slick in his villainous, sly role as Lynch, a CIA agent that cannot be trusted. Evidently, upwards of a dozen different screenwriters worked on this film as it languished in development hell before Carnahan became involved. He and writing parter, actor Brian Bloom, who also stars as another villain Pike, get credit, along with Skip Woods (X-Men Origins: Wolverine), and craft a fairly economic script that offers enough storytelling balanced with action. The film primarily acts as an origin story and adaptation of the original show's opening credits, showing how the soldiers of fortune came together and became fugitives on the run. Fans of the shows will appreciate hallmarks like the opening voice over, the trademark GMC Vandura, and other little references that are integrated into the film. While the goal and central plot remains the same throughout the film, the audience questions the nature of the film's true villains as characters interact with enough meaning and development to drive the narrative forward. This is by no means anything new or particularly original, but Carnahan and crew use the acting talent to the best of their abilities. The A-Team employs the device of characters explaining a plan in motion with cross cuts to that plan being executed and (a few too many) flashbacks to earlier scenes that fill in blanks to keep the viewer in on the plot. This provides good exposition but does get a little predictable and tired by the end. I found some of the obvious CGI shots contained within a handful of wildly ridiculous and over the top action scenes to be distracting, but generally, they play fluidly and fast enough to get you to the next scene. Say what you will of the Tank-flying scene shown in the trailer, but it was fun to watch. I was also amused at seeing Vancouver standing in for Mexico, Iraq, Colorado, Los Angeles, and Germany with the film's international flavour. I really enjoyed the film's end coda, despite its predictability in setting up a sequel. It offers one of the better, more surprising, less distracting or maddening cameos while setting up the procedural nature of the show with an after the credits scene as a nod to the 1980s show. One of the stranger scenes was Neeson and Jackson discussing Gandhi's theories on non-violent resistance, seriously. The A-Team is a fun ride that knows exactly what it is and what its audience wants. The actors were clearly having a good time and it shows and that infectious quality spreads to the viewer. 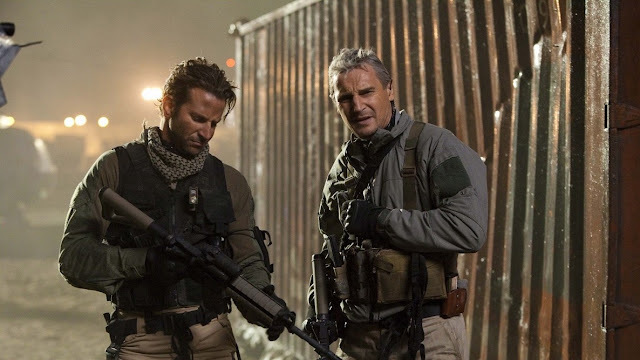 Director Joe Carnahan and crew have put together a somewhat elaborate plan of action with some creative, if not predictable, writing and a lot of acting talent, sitting back to watch it come together.